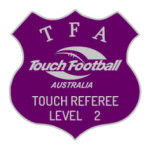 A Level 1 and Level 2 Referee course will be delivered by Matt Prendergast at the Toowoomba Touch grounds, Kearney’s Spring Sports Complex, Toowoomba on Saturday, 26/05/18, from 8:00am to 12:00pm. To register for either course, please click on the badges below and complete all of the mandatory fields which includes reading and agreeing to the terms and conditions contained in the National Membership & Participant Declaration. Registrations close on Monday 23/05/18. 2. 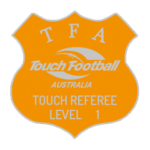 Complete the Australian Sports Commission Introductory Level Officiating General Principles course. 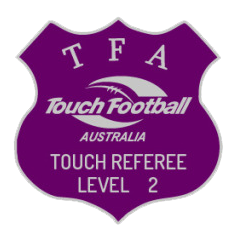 Email a copy of the ASC course certificate to SWQ Touch by Wednesday 23/05/2018.